Unless you live in Los Angeles, there is a good chance you've never heard of Acustalapse. And even if you do live there, you may have not have heard of them unless you've eaten at the iconic Jake's Cafe and Billiard Hall in Pasadena or The Park Bar and Grill in Burbank, two of three places where they headline as a resident band. No matter. Everything is changing for these indie alt rockers from Glendale. They finished fourth out of about 40 bands at Howl At The Moon Hollywood (battle of the bands); the only indie alternative band to break into the finals against cover and metal bands. They were invited to play Las Vegas at the new Vegas Rock N Roll Cantina (Oct. 29), shortly after having to pass on invites to ZombieFest in Las Vegas and Burning Man in the Black Rock Desert. They've been approached by several small indie labels (but haven't signed) and are chronic chart climbers on Internet indie stations. And they own the most downloaded song on an indie underground compilation, even if the outcome has been bittersweet. "They [Quickstar Productions] found us on MySpace and we sent them the final mix of the garage recording for Rid Kid," says frontman Robert Andersen (singer/guitarist). "But we don't promote the iTunes version of the song since we re-recorded it professionally and because Quickstar claims to be going out of business and unable to release royalties." The compilation bust was one of several raw deals the band has endured. Another was restarting the band when a fourth member dropped out. And somewhere between the bust up of Relapse and its reformation as Acustalapse, bass player Adrianna Parnagian was diagnosed with lupus. But these hard luck lessons are taking a turn for the best. The band's resolve has never been stronger. And Parnagian is the first to admit that the life-threatening but treatable illness helped change her life. "It changed my priorities, with following my dreams becoming the most important thing," says Parnagian. "In finding a balance so I could heal and live my life, I kept playing music, writing, and creating art. Throughout all of this, Robert and I always created and combined music, constantly co-writing music to capture the experience." 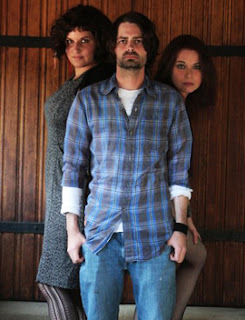 Nowadays, it is easily arguable that Acustalapse is stronger as a three piece with Andersen's sister, Kristen, on drums. Together, the three of them have made a connection deeper than many bands, spurred on by the drive to never give up. All of them are doing what they want to do. "Everything is different. We write different. Think different. Feel different," says Kristen Andersen. "But we still have the same ambitions, hopes, dreams, and know that we are building toward something self-fulfilling and worthwhile because we work on it together as a band." There aren't many bands that can claim to be tighter. Robert started playing at guitar at 15 and writing music at 16. Soon after, at age 12, his sister wanted to add a beat to her brother's songs, using nothing but pots and pans. Four years later, her father gave her a drum set for Christmas. Although not related, Parnagian might as well be. As a lifelong creative with her hands in music, writing, and art, she learned guitar at 16, switching out for bass at 20. Six months later, based partly on Parnagian and Kristen's mutual interest in art since they were teens, she was recruited as bass player. Anticipate an upcoming 3-track EP from Acustalapse soon. Nowhere is the tightness more obvious than in the work. They write their music eclectically, with Robert Andersen or Parnagian working alone, blending and bending their poems and riffs together as co-writers, or as a trio during impromptu jam sessions. The fluidity of it all is inspired. Just don't let the fan-made video pick throw you. There are some punk and grunge undertones tucked inside most of their indie alt rockers. Robert Andersen can easily snarl and growl with the best of them, stretching his voice to match the angst and then rolling it back just enough to convey that nothing much is ever insurmountable. The self-released three-track self-titled EP will feature of some live session favorites: Rid Kid, Scatterbrain, and Into The Blue. While all of them are already streaming at MySpace, SoundCloud, and Reverbnation, the release of an EP could help them break new ground on iTunes and Amazon or perhaps entice a mid-size or larger label to sign them. "I always felt that Adrianna and Robert reached new heights with this song. Robert's vocals and solo and Adrianna's entire bass lick show their passion and the soul of our music," says Kristen. "This song shows how we can come together as three individuals and unite as a band." All three of the tracks on the upcoming EP are easily worth the download. Any of their songs are for that matter. Add to all that their willingness to work with and promote other artists for mutual success in what has become an ocean of indie releases, and there seems to be little doubt that they will push through the blue, if anybody does. As An Indie Pick, Acustalapse Belts Out 8.2 On The Liquid Hip Richter Scale. There is plenty to like about Acustalapse as an indie band on the rise. While their style clearly sounds more at home alongside the best garage rock from another era, the lyrics are fresh cut on relevance, like writing songs that are worn but pay homage to all those kids on Ritalin. And then they lay it all down against heavy bass lines, guitar crunches, and addictive drum beats. They are unabashed, unafraid, and still under covered. Robert Andersen is especially adept in his delivery. He doesn't hold back, not in his solo songwriting on tracks like Scatterbrain or in singing. When he sings it, he means it. But when he feels it, he doesn't need to take the lead. Perfect. You can find the original garage recording of Rid Kid on iTunes. But given the band's experience with the producers of the compilation, purchasing Acustalapse songs off Reverbnation might be the better bet. Or, purchase them from the new EP recently released on iTunes. You can also find the EP on Amazon. Downloading any other song will support the band, but they will need every download of Rid Kid, Scatterbrain, and Into The Blue to count.